Osteopetrosis (OP) is a heterogeneous group of rare, inherited disorders of the skeleton that results in neurological manifestations due to restriction of growth of cranial foramina and calvarial thickening. It is a heterogeneous group of osteosclerotic bone dysplasias in which the entire skeleton is unusually dense. It is divided into several subgroups which differ in their onset of symptoms, severity, and associated extraskeletal manifestations. Craniosynostosis (CS) is the premature fusion or abnormal development of one or more cranial sutures. Causation divides the group into primary and secondary CS (vide infra). Chiari malformation (CM) describes a group of structural defects of the cerebellum, characterized by brain tissue protruding into the spinal canal. The association of OP with CM and CS has been previously reported. , The triad of the three abnormalities has been published only once, however, with no genetic study. Herein, we describe another patient with malignant OP, CS, and CM1. Molecular testing revealed novel mutation homozygous in OSTEM1 gene. 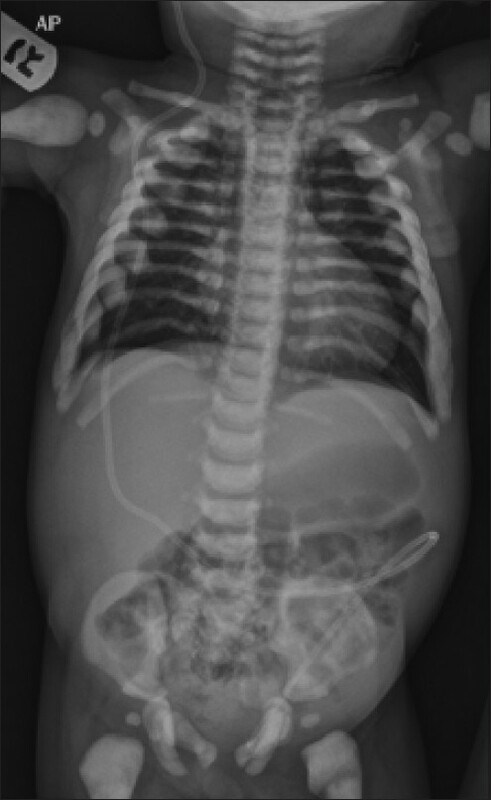 The index is 9-month-old Arab infant, who was a product of full-term gestation following uneventful pregnancy delivered via normal vertex delivery with no postnatal complications and average birth weight. He is the only child of first cousin parents. They are apparently healthy and the mother has no history of abortions, unexplained neonatal deaths, or mental retardation in their close family members. The patient started to have irritability at 2 nd week of life increasing with time. He fed well; however, his irritability was not related to feeds. There was no history of vomiting and his parents did not report any abnormal movements. 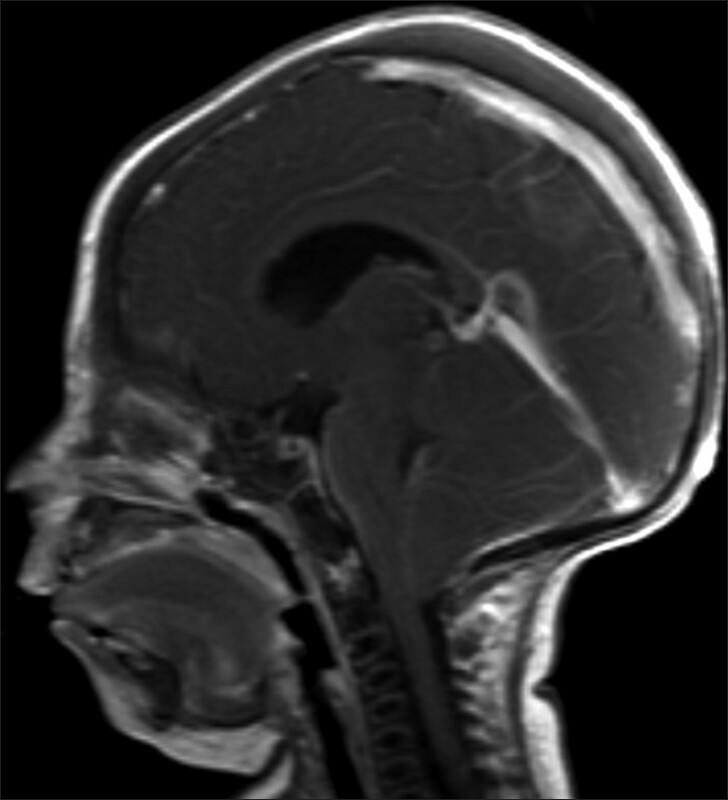 At the age of 3 months, congenital cytomegalovirus infection was considered by different clinics due to abnormal cerebrospinal fluid analysis and brain atrophy shown on his brain computed tomography (CT). Despite receiving gancyclovir for 3 weeks, the patient's irritability did not improve and eventually presented to emergency with continuous irritability and abnormal movements for 2 days after falling down from his cot (50 cm height). Six hours later he started to have up rolling of eyes with cessation of breathing, followed by generalized stiffness and clonic jerks in all limbs that increased in frequency lasting from seconds to 5 minutes. The baby was initially able to fix and follow; however, roving eye movements were noted at 3 months of age. Motor, cognitive, and speech functions were impaired, mainly at gross motor aspect. Evoked visual potential testing at 8 months of age revealed evidence of bilateral optic atrophy. Clinical evaluation at 9 months showed an irritable baby, microcephaly (below third centile), closed anterior fontanel and ridging of coronal and sagittal sutures. The weight and the length were at 10 th centile. He had bilateral proptosis with roving eye movements and dilated pupils with sluggish reaction to light. Other cranial nerves were intact. He had mild hypertonia in all limbs with axial hypotonia. Power was normal in all muscle groups. Deep tendon reflexes were +2 in all limbs. He had no apparent bony deformity and there was no evidence of fractures. He had no organomegaly and other systemic examination was unremarkable. Baseline CBC showed mild microcytic hypochromic anemia, leukocytosis. Serum electrolytes, liver transaminases, and blood gas were normal. CT of brain showed presence of dilated ventricles with thick skull bones. Skeletal survey showed sclerotic bone [Figure 1]. His seizures were controlled and ventriculoperitoneal shunt was inserted on 2 nd day of admission. Preinsertion skull three dimensional CT showed fusion of coronal and sagittal sutures [Figure 2]. Postoperative magnetic resonance imaging brain showed decompression of ventricles with presence of CMI [Figure 3]. Patient had signs of left lower motor neuron facial palsy, which was evident on 2 nd day postinsertion. 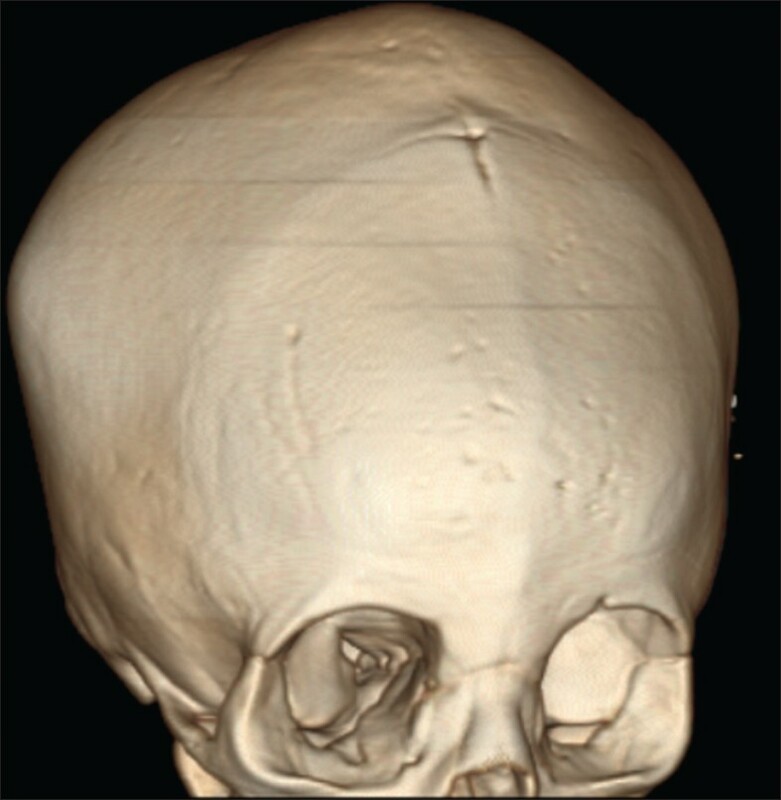 A repeat CT of petrous bones showed osteopetrosis with slim mastoid portions of the facial nerve canal on both sides. Molecular genetic analysis for OSTEM1 gene revealed two homozygous mutations in the OSTEM1 gene. This has not, to the best of our knowledge, been reported previously. The first mutation involves exon1; c. 365 T < A, (Val122Asp). The comparison of OSTEM1 amino acid sequences derived from numerous species indicates that the Val122 is not well-conserved (conserved in 9/16 species). Valine and aspartic acids are dissimilar amino acids. However, the lack of high conservation suggests that the Val122Asp may represent a neutral variant. The second mutation of OSTEM1 exon1c. 108C < T transition does not result in an amino acid substitution (GGC and GGT are both codons for glycine). However, the c. 108C > T transition may create a new donor splice site (GT) and result in aberrant mRNA processing. Analysis of the exon 1 of OSTEM 1 gene in both parents revealed a heterozygous c. 108C > T transition and a heterozygous OSTEM1 exon 1c. 365T > A transversion. CLCN7 and TCIRG1 genes were normal. OP was first described in 1904, by German radiologist Albers-Schönberg. It is a clinical syndrome characterized by dynamic imbalance of the bone cells and failure of osteoclasts to resorb bone. As a consequence, bone modeling and remodeling are impaired. The defect in bone turnover characteristically results in skeletal fragility despite increased bone mass, and it may also cause hematopoietic insufficiency, disturbed tooth eruption, nerve entrapment syndromes, and growth impairment. Our patient had clinical, radiological, and hematological manifestations of OP, with autosomal recessive inheritance highly possible in the presence of first cousin consanguineous parents. The child had bilateral optic atrophy, left lower motor neuron facial palsy, and anemia. Genetic mutational studies confirmed the presence of OP. The early irritability of the baby could be explained on the basis of CS with subsequent increase in intracranial pressure. This was confirmed by CT of skull that showed CS of coronal and sagittal sutures [Figure 2]. The same applies to the finding of proptosis. We acknowledge the work of Samar Adel for the preparation of the manuscript. 1. Dlouhy BJ, Menezes AH. Osteopetrosis with Chiari I malformation: Presentation and surgical management. J Neurosurg Pediatr 2011;7:369-74. 2. Glass RB, Fernbach SK, Norton KI, Choi PS, Naidich TP. The infant skull: A vault of information. Radiographics 2004;24:507-22. 3. Leikola J, Haapamäki V, Karppinen A, Koljonen V, Hukki J, Valanne L, et al. Morphometric comparison of foramen magnum in non-syndromic craniosynostosis patients with or without Chiari I malformation. Acta Neurochir (Wien) 2012;154:1809-13. 4. Jamjoom AA, Jamjoom BA, Waliuddin AR, Jamjoom AB. Lessons from a case of osteopetrosis oxycephaly and Chiari type I malformation: A case report. Cases J 2009;2:6787. 5. Albers-Schonberg H. Roentgenbilder einer seltenen Knochennerkrankung (A rare Bone Disease). Munch Med Wochenschr 1904;51:365. 6. Stark Z, Savarirayan R. Osteopetrosis. Orphanet J Rare Dis 2009;4:5. 7. Superti-Furga A, Unger S. Nosology and classification of genetic skeletal disorders: 2006 revision. Am J Med Genet A 2007;143:1-18. 8. Silva, Sandra; Philippe Jeanty (1999-06-07). "Cloverleaf skull or kleeblattschadel". The Fetus.net. Macromedia. http://www.thefetus.net/. Retrieved 2007-02-03. 9. Slater BJ, Lenton KA, Kwan MD, Gupta DM, Wan DC, Longaker MT. Cranial sutures: A brief review. Plast Reconstr Surg 2008;121:170-8. 10. Gault DT, Renier D, Marchac D, Jones BM. Intracranial pressure and intracranial volume in children with craniosynostosis. Plast Reconstr Surg 1992;90:377-81. 11. Bannink N, Nout E, Wolvius EB, Hoeve HL, Joosten KF, Mathijssen IM. Obstructive sleep apnea in children with syndromic craniosynostosis: Long-term respiratory outcome of midface advancement. Int J Oral Maxillofac Surg 2010;39:115-21. 12. Kimonis V, Gold JA, Hoffman TL, Panchal J, Boyadjiev SA. Genetics of craniosynostosis. Semin Pediatr Neurol 2007;14:150-61. 13. Cleland J. Contribution to the study of spina bifida, encephalocele, and anencephalus. J Anat Physiol 1883;17:257-92. 14. Schijman E. History, anatomic forms, and pathogenesis of Chiari I malformations. Child Nerv Syst 2004;20:323-8. 15. Aitken LA, Lindan CE, Sidney S, Gupta N, Barkovich AJ, Sorel M, et al. Chiari Type 1 malformation in a pediatric population. Pediatr Neurol 2009;40:499-54. 16. Kulkarni ML, Marakkanavar SN, Sushanth S, Pradeep N, Ashok C, Balaji MD, et al. Osteopetrosis with Arnold Chiari malformation type I and brain stem compression. Indian J Pediatr 2007;74:412-5. 17. Dowlati D, Winston KR, Ketch LL, Quinones R, Giller R, Frattini A, et al. Expansion cranioplasty with jackscrew distracters for craniosynostosis and intracranial hypertension in transplanted osteopetrosis. Pediatr Neurosurg 2007;43:102-6. 18. Krimmel M, Niemann G, Will B, Reinert S. Surgical correction of craniosynostosis in malignant osteopetrosis. J Craniofac Surg 2004;15:218-20. 19. Engel M, Castrillón-Oberndorfer G, Hoffmann J, Orakcioglu B, Rohde S, Seeberger R, et al. Chiari malformation in nonsyndromal single craniosynostosis---Much ado about nothing? Acta Neurochir (Wien) 2012;154:1803-7. 20. Levitt MR, Niazi TN, Hopper RA, Ellenbogen RG, Ojemann JG. Resolution of syndromic craniosynostosis-associated Chiari malformation type I without suboccipital decompression after posterior cranial vault release. J Neurosurg Pediatr 2012;9:111-5. 21. Strahle J, Muraszko KM, Buchman SR, Kapurch J, Garton HJ, Maher CO. Chiari malformation associated with craniosynostosis. Neurosurg Focus 2011;31:2. 22. Cinalli G, Spennato P, Sainte-Rose C, Arnaud E, Aliberti F, Brunelle F, et al. Chiari malformation in craniosynostosis. Childs Nerv Syst 2005;21:889-901.